Over 20 years ago I began exploring dirt roads, ghost towns and hot springs in Nevada. I’ve since held a fascination for the Black Rock Desert and have returned every year. The Bungalow is my resting spot in the desert. Built in Reno in the late 40’s, the previous owner had the duplex hauled to Gerlach many years ago - in one piece! Improvements have been made (with many more to come) yet the Bungalow still houses some of it’s original charm-- original metal sinks and cabinets in the kitchens, metal closet doors and a few remaining vintage fixtures. Local granite, shale and tufa tuffs have been brought in for landscaping. Native and other drought resistant species have been planted. A lush summer garden offers fresh vegetables for guests and a fire pit lights up warm summer nights. Each unit is a cozy one-bedroom with an additional futon in the living room. Bathrooms are newly remodeled and each kitchen is equipped for cooking. Rooms are boldly painted with stylish appointments that add to the “funky Nevada” feel. An ongoing work in progress and a star or two short of five, the Bungalow strives to deliver a comfortable resting spot with a true desert vibe. 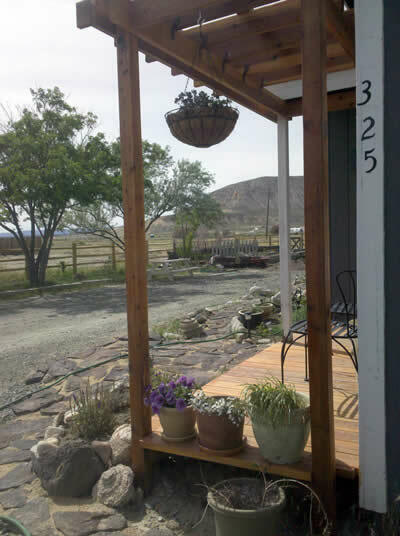 Steps from “downtown” Gerlach, it’s the perfect vacation home base for your Black Rock Desert getaway.